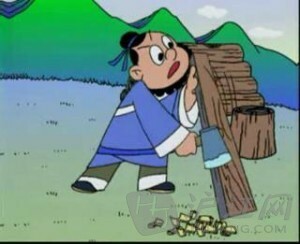 Lu Ban (鲁班) was supposed to be a consummate carpenter in ancient times. It is said that he once carved a wooden phoenix that was so lifelike that it actually flew in the sky for three days. Thus it was considered the height of folly to show off one's skill with an axe in front of Lu Ban. I'm making a fool of myself trying to show off before an expert like you. My son, fresh out of college, keeps telling me how to run my business. But I've been making good money for 30 years so he's teaching a fish how to swim.